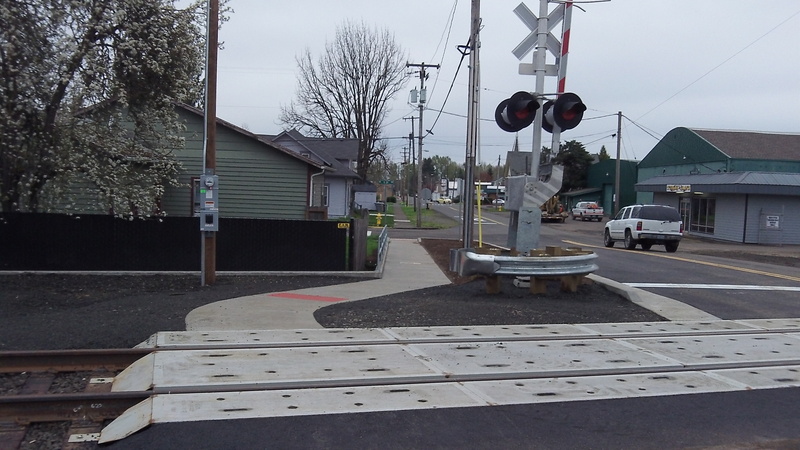 Take a look at this railroad grade crossing, newly rebuilt and opened last week on Albany’s Main Street S.E. When I went by there on March 28, the day the crossing was reopened, the alignment of the new sidewalk struck me as unusual. It goes around the gates, so when the arms are down the sidewalk stays open. This arrangement struck me at first as an invitation to pedestrians to cross the tracks even when the lowered gates and flashing lights — not to mention the ringing bell — signal an approaching train. 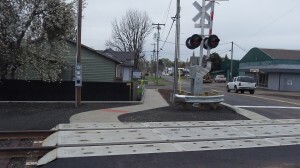 But as it turns out, this is not unusual at all, which I realized when I looked at other grade crossings in the neighborhood and inquired with ODOT Rail. I had not paid much attention to walkways at rail crossings, maybe because at many crossings around here there are no sidewalks at all. 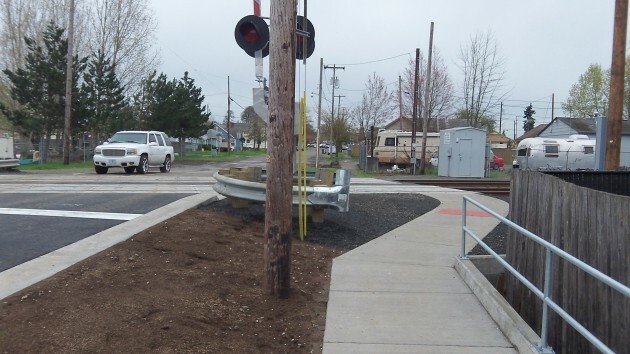 Only the brand-new construction at this one, complete with a railing, pedestrian warning strip and the curve around the signal mast, made this one stand out. Are the “pedestrian warning strips” so that the blind people know what hit them?